pseudobunny & co.: Finally. Some Craft. I know that your fingers are numb from anticipation. 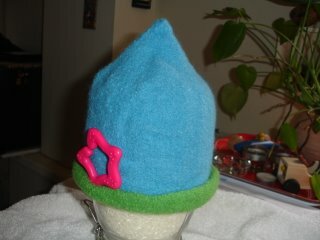 First, I present the felted hat project from my SP, Zillah the Sarah. First time felting and I did it by hand cause the washer is a front loader. Didn't take too long. I dunked and zszszszs'd it once in hothothot water and let it go into some cold, let it dry for a minute and repeated the process. I think it was fun to see it change so dramatically. I really like how the stitches disappear. 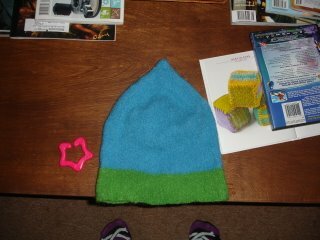 I did not do the accent stitches on the hat cause I forgot. I think I am going to sew a patch on it or something though. 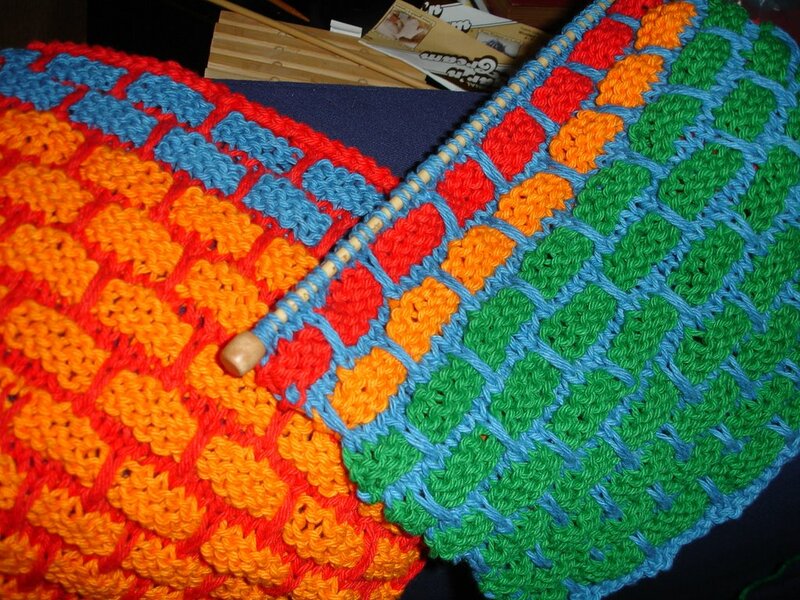 And thanks to Mason-Dixon Knitting I am now officially addicted to the warshrag. Specifically the ballband warshrag. So don't be surprised if you get one soon. Like real soon cause I cant stop making the dern things. 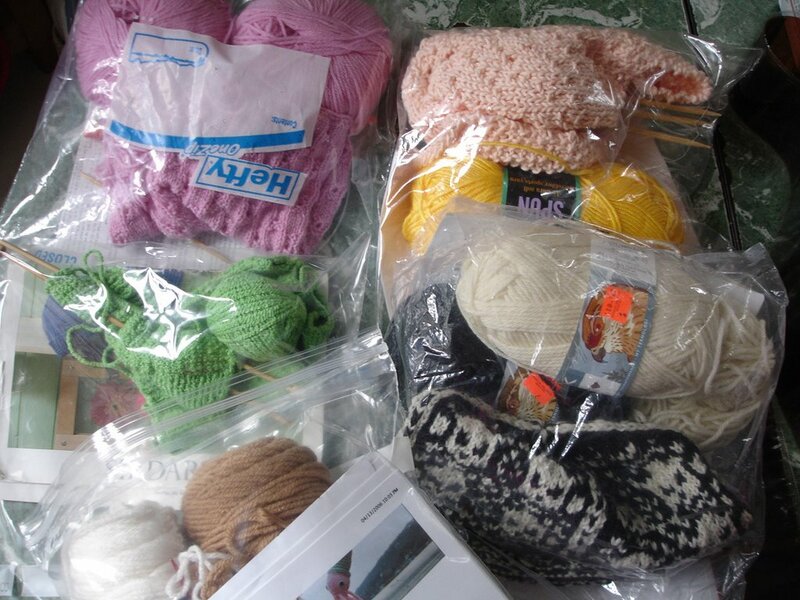 And the cotton yarn used ( Peaches and Creme Worsted Weight 4-ply Cotton) is not only cool to the hands while k-nitting in this wonderful heat wave, it is so cheap I do feel like I am stealing when I pay for it. Amazing. 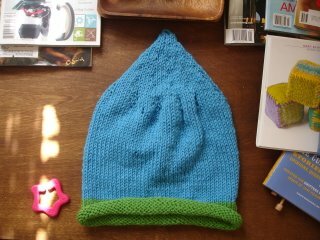 And fun to knit. But I can't seem to find the cable scarf. That was my favorite part to make too. I think I just must have it hidden in one of the many bags I have. So when I do get the entire ensemble together I will post another one. So now I have to finish the bagged and organized WIP's from ages ago. Wish me luck. And I just hope the warshrags dont get in the way. Or a sale bin full of the cotton yarn ( Cotton Classic by Thaki Yarns) I need to make the Mitered Square Blanket. *shakes fists at the sky* WHY LADIES WHY DID YOU HAVE TO MAKE SUCH AN AWESOME BOOK?????????!!!!! going to eat some ice cream now. Oh my GAWD! 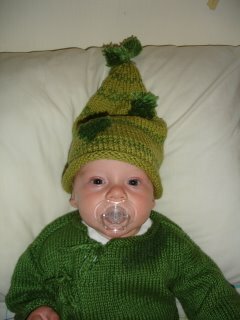 that hat is cute and the other green hat LOVE IT! Where did you get the pattern? WOW! Across the country! Well you will have a package when you get back. I mailed it out yesterday. ho sistah, you get mad knitting skills, eh? too bad stay too hot fo' wear you stuffs, mebbe you can knit me one bikini? ho, try! den i can sell um at da craff fairs and make sum money, lidat. den i can come to sanfran and wea' yo beanies. cheeeee-ho!